Spot styrene prices have posted three-digit decreases both in Europe and Asia over the past week as per the pricing service of ChemOrbis. The weakness across the major styrene markets was attributed to bearish energy costs as well as stagnant demand. Before gaining over 2% on November 14, crude oil prices on the ICE Futures Europe Exchange and NYMEX had dropped to their lowest levels since September 2010, with Brent crude futures declining below the $80/barrel threshold. In Europe, spot styrene prices slumped by over $200/ton on the week and dropped below the $1400/ton threshold on an FOB NWE basis, hitting the lowest level in over two years. Market sources commented that spot styrene prices erased all of gains which followed the shutdown of the petrochemical complex at Moerdijk, the Netherlands after declining for a second consecutive week. 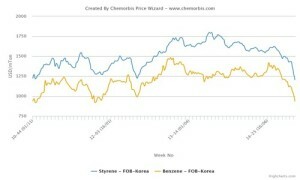 For benzene, spot prices on a CIF NWE basis also posted three-digit decreases from the previous week and broke below the $1000/ton threshold. Following the recent decreases, spot benzene prices hit their lowest level since January 2012. In Asia, spot styrene prices declined by $100/ton on an FOB South Korea basis at the end of last week. Prices on a CFR China basis also posted weekly decreases of $95/ton. According to ChemOrbis, the fall in styrene prices was led by lower spot benzene costs which also witnessed three-digit drops compared to last week. Following their latest decreases, spot styrene prices in the region reached the lowest level recorded since end 2010.